Is it “Staged” if there’s no furniture? The Refreshed Home replies with a resounding YES! 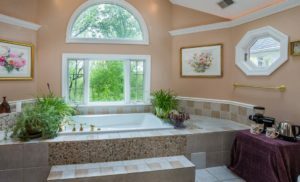 Thoughtful and quality updates, and a fresh new color palette got this luxury home sold quickly, and at full ask. Here are some of the B&As. Background: A lovely house built with quality materials, but the market changed mightily in the time they owned it. 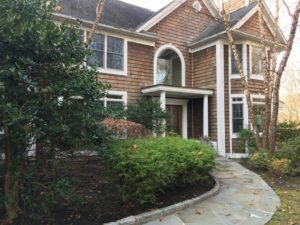 Decreased demand for 7-figure properties, buyer preferences, competition, even how technology has shaped buyer decision process all contributed. After several listing cycles they saw what wasn’t working. 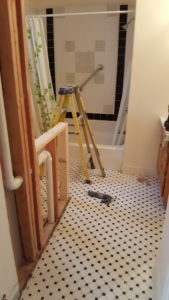 Challenges: Big plus: their contractor was an experienced flipper/builder as well as a trusted friend. He and I worked collaboratively on other projects; they had seen his prior work, and the results first-hand. Still, solving problems often means introducing paradigm shifts…asking a client to re-think issues, and how they’ve shaped decisions in the past. Also, what to call this work?! 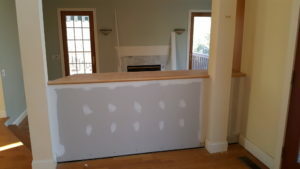 Shrug if you want, but the right word was crucial: Staging, renovating, decorating or updating? Each resonated differently, we went with REFRESHED! As far as the work went, this was a large house, with an open floor plan. There were design details with time stamps throughout; every room needed to be considered. We sought the most cost-effective improvements that would breathe new life into the costly and more permanent fixtures and features. 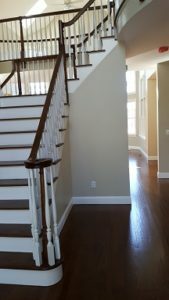 First impressions are everything, there were too many finishes and woodworking details in entry. Solution: Current color palette was underwhelming. It didn’t speak to the scale of the property, or ‘read’ well on smart phone screens. New deeper colors and finishes added presence and contrast, drawing your eyes throughout the space. Carefully chosen updates better defined and improved spaces, adding value. 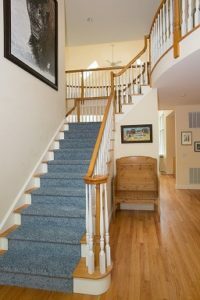 Decorative props highlighted key features, adding warmth and punctuation to listing photos. 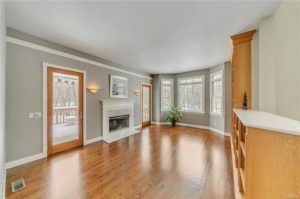 They also drew buyers throughout the entire house during showings-KEY for an unfurnished space! 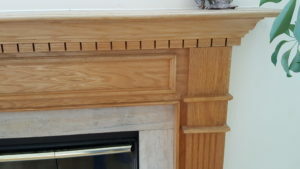 Golden oak mantle with dentil moulding and reeded pilasters: too much detail, too much of a mix of materials and textures. The marble (LR) and travertine (Family Room) surrounds underneath were enough, classic and elegant. 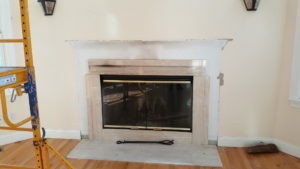 Oak was removed, new mantle was built on site, framing existing stone, then painted to match trim. Results: Even with a late/shortened spring, and buyer uncertainty about new tax laws in first half of 2018, there were several bidders, and a full-ask offer of $1.3M was accepted in 69 days. Sort of an unwritten rule, bathroom photos tend to get buried in the photo lineup, but these two were gamechangers. 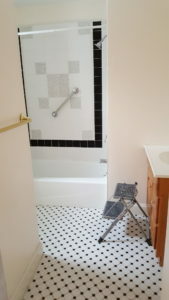 Above: Master Bath All tile, tub and vanity stayed; new wall color to breath fresh life into tilework. 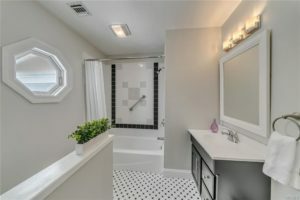 A simpler, less figured granite vanity top, and brushed nickel fixtures replaced all the gold accents: Shower surround, lighting, faucets, etc. Left: Upper Hall Bath Full wall on left side of entry made room feel small, and blocked light from only window.